Where I live, summer storms are very common in the spring and summer. 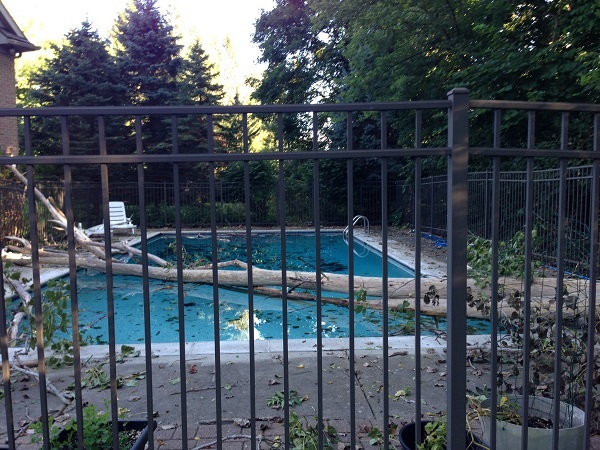 As you can see in the pictures of my dad’s backyard, they can cause a lot of damage. thunder storm: a storm with thunder and lightning. lightning: the flash of light in the sky during a storm. We say lightning “strikes” and call the flash of light a lightning bolt. thunder: the loud noise in the sky that comes after lightning. hail: small pieces of ice that fall from the sky like rain. Did you notice that we say “heavy rain”? Heavy rain: (noun) when there is a lot of rain. The weather service announces alerts on the radio and television as well as sends alerts to mobile phones. The alerts warn us about things like thunderstorms and severe storms. 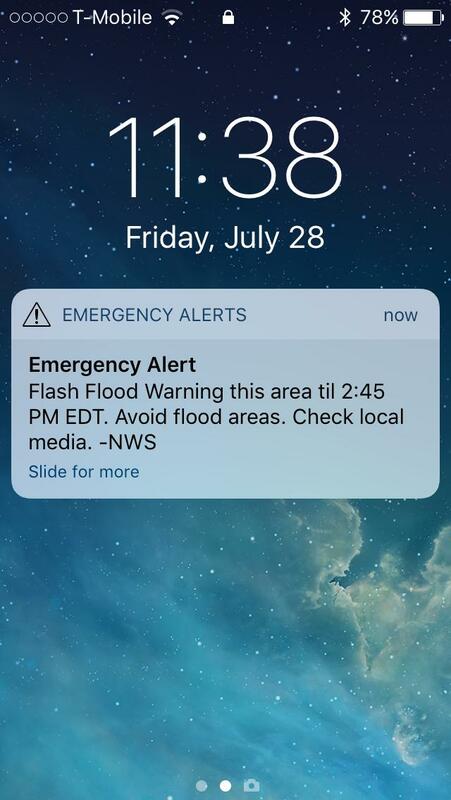 Here’s a screen shot of an alert from this summer for a flash flood warning. An alert can be either a watch or a warning. If it’s a watch it means there is a possibility of severe weather. If it’s a warning then it means we should go inside or seek shelter because dangerous weather conditions are present or about to happen. The pictures of my dad’s pool offers some good lessons about safety. There are several things in the pictures that attract lightning: metal fences and trees. You should stay away from (= don’t go near) metal objects and tall trees and go inside to a place without windows. You should also stay away from phone lines and power lines. If you’re in a pool, get out of the water right away (=immediately). You wouldn’t want to get electrocuted (injured killed by electric shock, which passes electricity through the body). The tree in the picture was struck by lightning. An electric current in the water can harm or kill a swimmer. 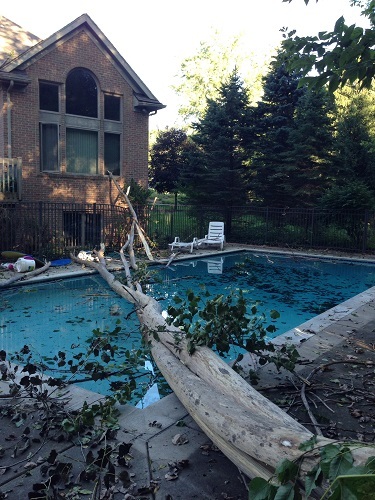 If lightning strikes the ground around the pool area, shocks can happen in other areas because the surface is connected via underground water pipes, electric wiring, etc. 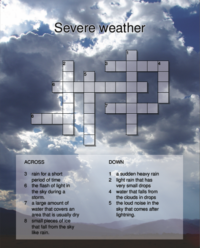 Want to learn more weather vocabulary and also hear it pronounced? Click here to see a video and more information. Have there been any dangerous weather conditions or storms in your area recently? When was the last severe weather you experienced? What type of weather was it? Please tell me about it in the comments section below.